Situated in the heart of beautiful Gatlinburg, Tennessee – less than 2 miles from downtown – Gatlinburg Amazing Grace boasts the best of both worlds – panoramic views of the Great Smoky Mountains and the city lights of downtown Gatlinburg. 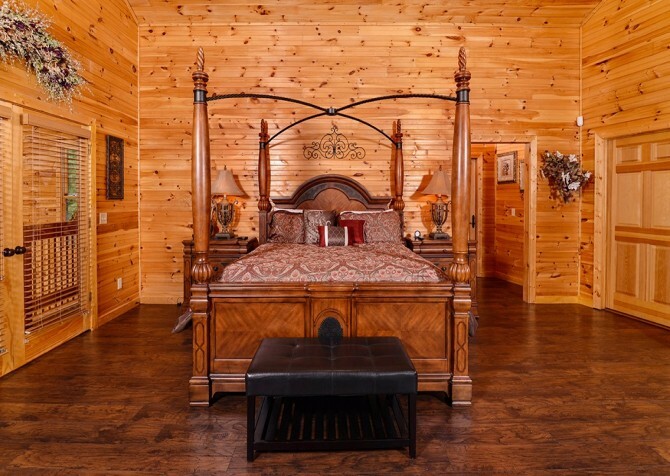 Elegant landscaping greets guests as they drive up to this luxurious 3-story log lodge with beautiful iron gates. With 10,000 square feet of space, stylish décor, high-end furnishings, and modern amenities, this Gatlinburg escape offers everything a large group needs for a comfortable, fun, and relaxing stay in the mountains. Within 8 spacious bedrooms and 8 ½-bathrooms guests will find ample space for accommodating up to 29 guests – great for a church retreat, family reunion, or large group vacation. 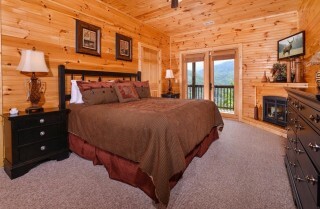 Pamper yourself and family and friends at the luxurious Gatlinburg Amazing Grace, where no detail has been overlooked. Spend days playing games in a rec room that takes it to the next level. 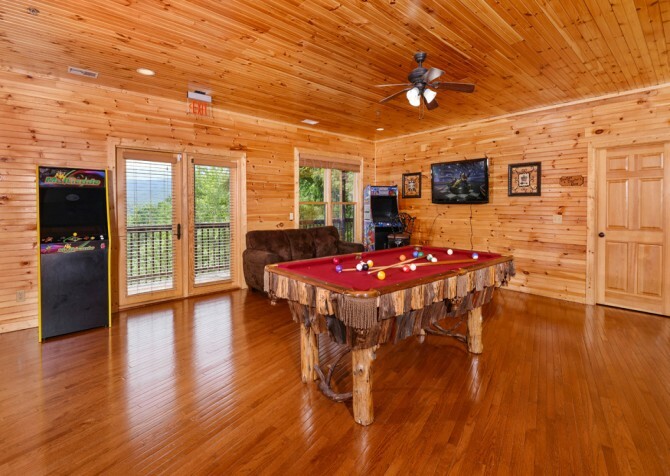 A log pool table is the centerpiece of this fun space, surrounded by arcade games, cozy couches, a big screen TV, and even a kitchenette! Multiple hot tubs give you places to unwind in the fresh mountain air, tons of deck space gives a group room to spread out, the bedrooms are luxurious retreats, and the spectacular views can’t be described in words! When you want luxury, comfort, fun, and convenience, Gatlinburg Amazing Grace delivers! Located minutes from downtown, Gatlinburg Amazing Grace also makes it easy to explore the area – if you can peel yourself away from the luxury lodge. 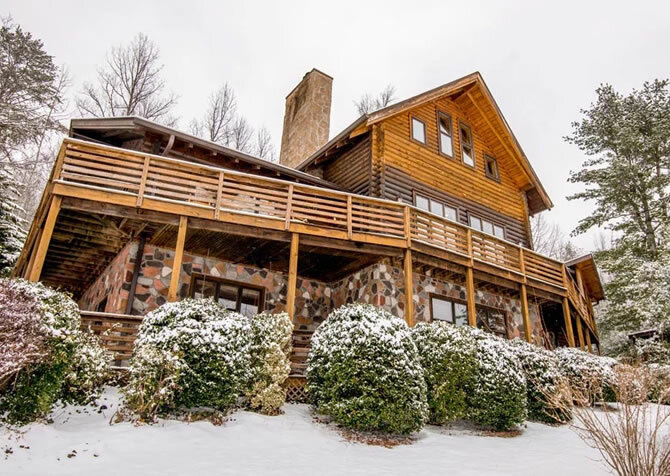 From downtown, you can see your stunning space tucked among the trees, beckoning you back for hot tub soaks, movie nights, and quiet evenings on the deck. The main living room is a gorgeous community space for family and friends to gather. Soaring ceilings and tons of windows make the space feel absolutely huge. The stacked-stone fireplace is a stunning showpiece, reaching high up to the ceiling. 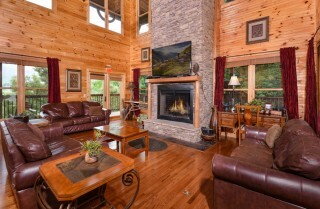 On those cool Smoky Mountain evenings, gather in front of the wood-burning fireplace to play, relax, and tell stories. A 70-inch flatscreen TV sits above the mantel, and 3 large, plush sofas surround it. 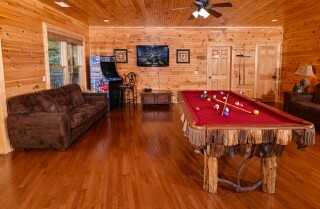 In the middle of the room is a coffee table that's great for playing card games or board games. There are also two side tables by the sofas that offer places for guests to keep drinks and snacks nearby. You'll enjoy a blend of views from here, including lush woods and beautiful rolling hills. On sunny days, the light will flow in through the many large windows. 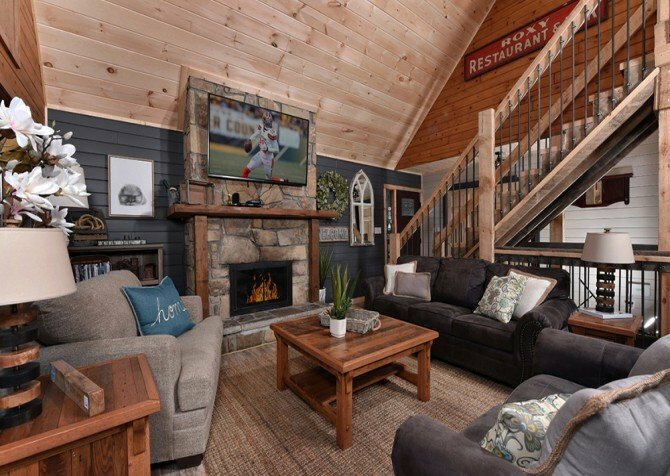 It is the perfect luxurious space for groups to gather and enjoy quality time together, play, or watch a ball game. You can also take advantage of the Wi-Fi here. Find group discounts for area attractions, check out local events, or make reservations at restaurants downtown. 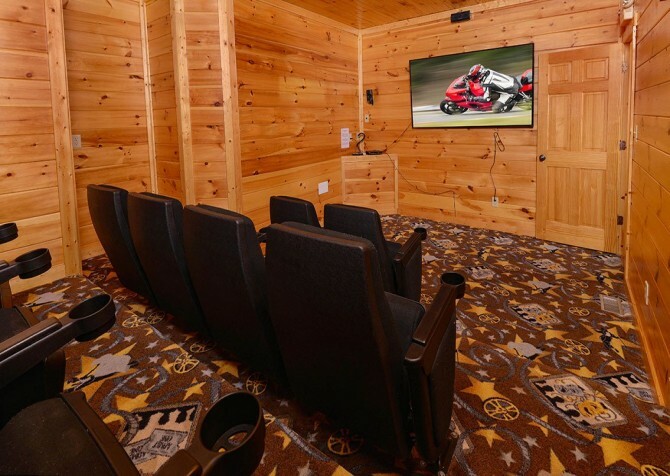 Catch up on shows, let the kids watch morning cartoons, or gather for a movie night in this spacious and luxurious living area. 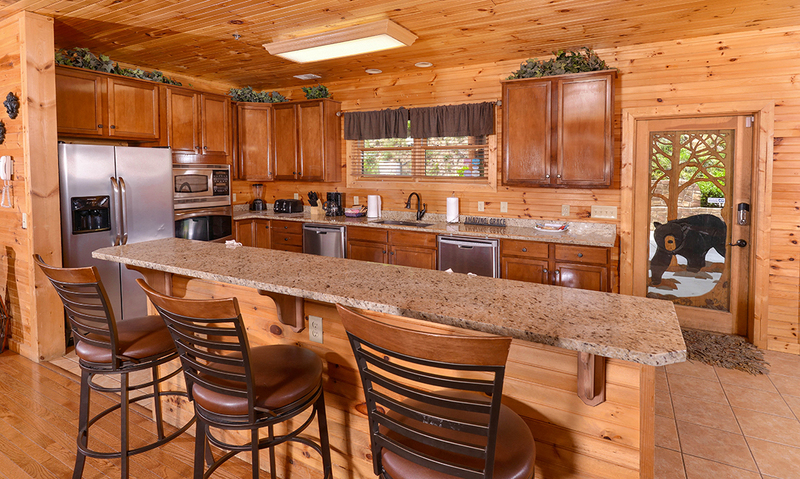 Great for cooking group meals in the cabin, the fully equipped kitchen features stainless-steel full-size appliances and a breakfast bar. The modern and bright space is furnished with one full oven, a convection microwave, a refrigerator, and plenty of tools and small appliances to make group meals easy. There is also an additional refrigerator in the rec room, offering plenty of space to keep leftovers, drinks, and snacks. 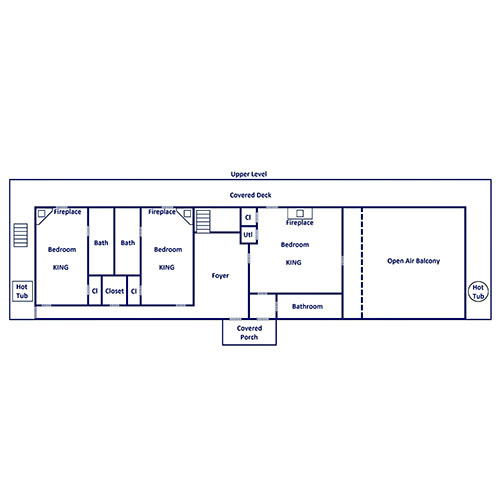 You'll have plenty of room to prepare in this high-end kitchen, and you can visit with those dining with the open layout. Several guests can snack or dine at the breakfast bar, or you can set out a buffet for everyone to enjoy. 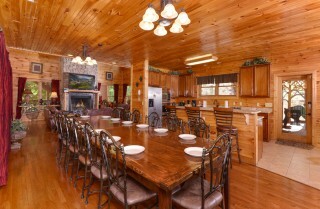 Cooking in the cabin is also great for groups because it saves you the hassle of trying to find seating for 29 people. You'll find all you need to make group meals that you can enjoy on the decks or in the dining areas. 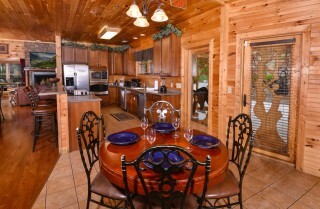 The kitchen also features one of the cabin’s unique details: a gorgeous custom door with a bear-and-tree wood carving. It’s unique details like this that really set Gatlinburg Amazing Grace apart. 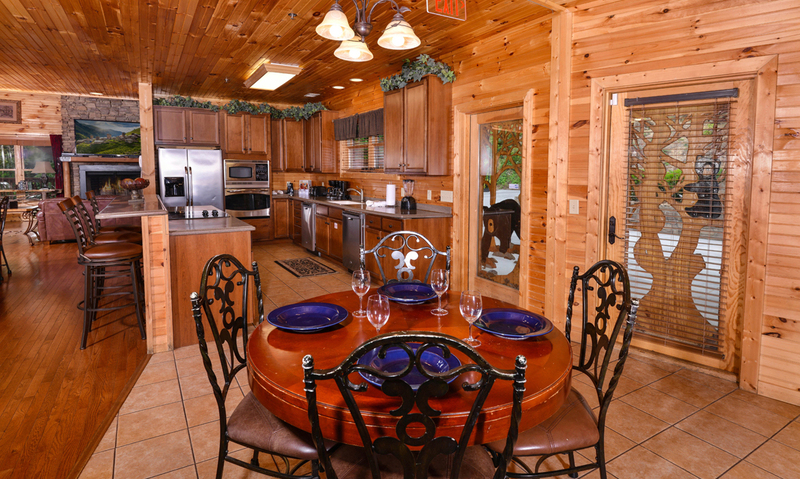 After preparing snacks and delicious homemade meals, step into the beautiful dining area to enjoy. A long table with iron chairs sits in front of windows that frame beautiful Smoky Mountain views – a luxurious place for a memorable meal in the mountains. The large dining table offers seating for 14 guests and is just steps from the kitchen. It will be easy to bring homemade dishes into the dining area or for guests to get seconds. A second dining table next to the kitchen offers additional seating. The lovely round table features four iron chairs around it. Along with offering more seating, it's a great way to allow your group to split up and have more intimate meals. A unique log side table with lamps adds some mountain charm to this great dining space. 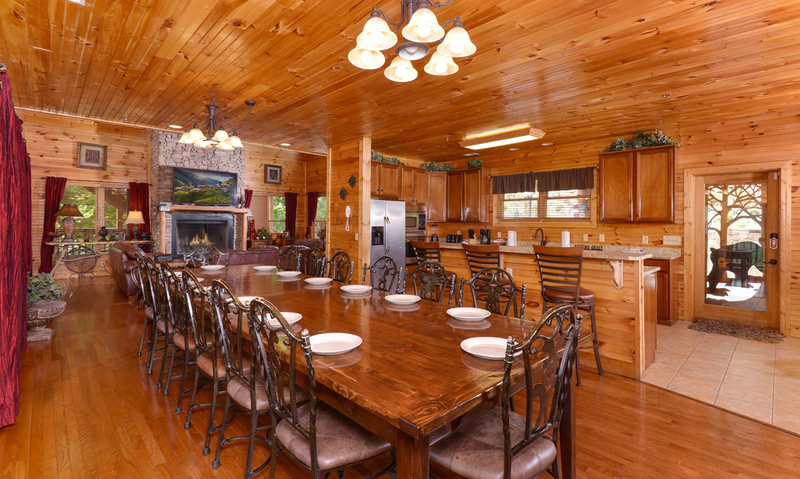 The dining areas also showcase the unique style of Gatlinburg Amazing Grace, which beautifully pairs elegant décor with a rustic mountain feel. 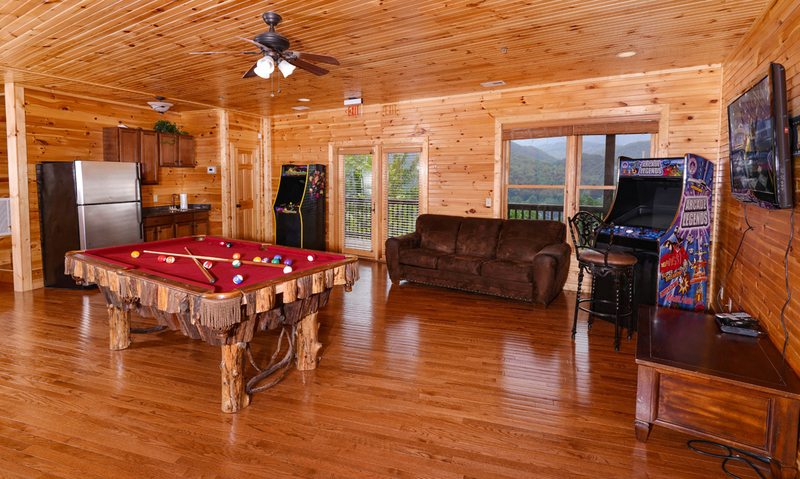 Boasting beautiful wood floors, awe-inspiring Smoky Mountain views, games, and comfy places to relax, the rec room will be a favorite spot of both kids and adults. A step up from your downtown arcade, this gorgeous space lets you play a few rounds on the custom log pool table, feel nostalgic as you play games on the arcade consoles, or curl up on the comfy sofas and watch movies on the 47-inch flatscreen TV. Kids and adults will spend hours playing and hanging out in this spacious room. There is even a wet bar and a full-size refrigerator, so you can keep snacks and drinks at arms' length. Kick up your feet on a plush sofa and enjoy a cocktail or glass of local wine between shots on the pool table. 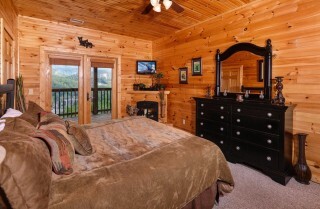 A half bath is also conveniently located in the rec room. Whether you're with family or friends, you'll find hours of entertainment in this lovely rec room. If you need extra sleeping space, you’ll find two sleeper sofas in the rec room. Three levels of decks provide great outdoor spaces for guests to enjoy the beautiful Smoky Mountain views and weather. 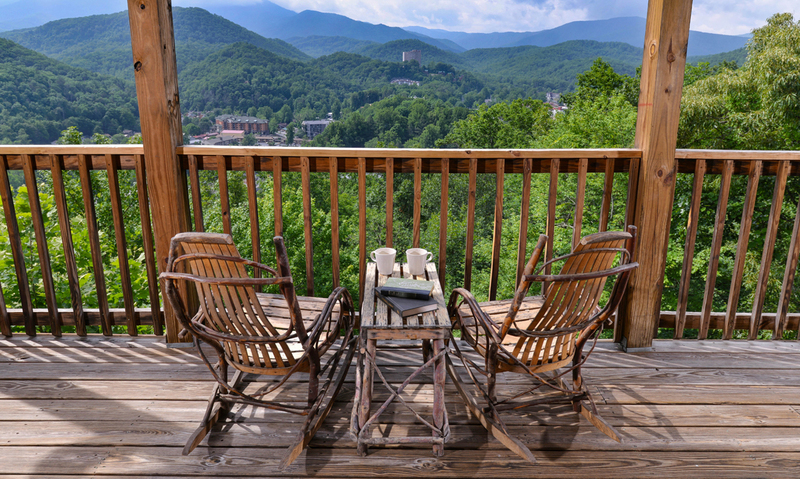 Rustic log rocking chairs with a small table are ideal for enjoying a cup of coffee in the morning. After long days, the 2 outdoor hot tubs are ideal for soothing tired muscles and unwinding. They're also great places for couples to enjoy some romantic time together. 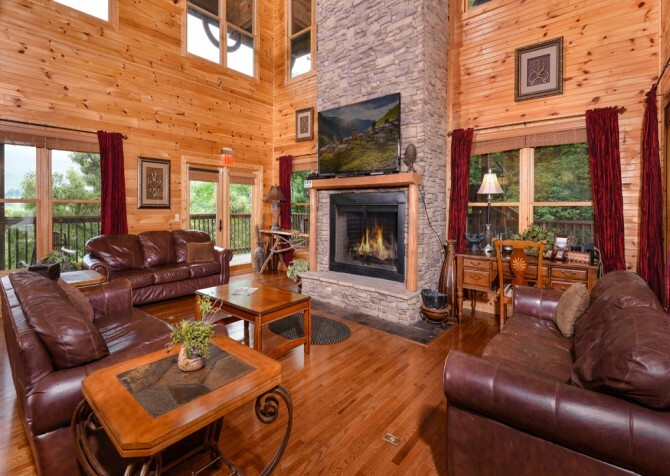 Just imagine soaking in the warm, bubbling waters as you look out over the rolling hills or feel tucked away in the trees. The decks also look out over the city, so you can enjoy the lights at night as you sip some wine or a cup of coffee before heading off to bed. 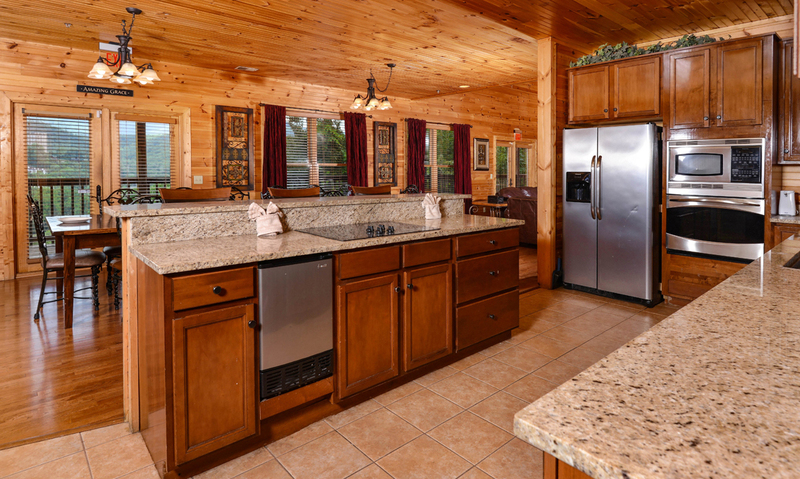 The log exteriors provide that classic cabin feel, and the paved driveway is a convenient perk. The lighted stone feature and street lamps offer a grand welcome as you arrive. You will truly feel like you're arriving at a luxury lodge when you pull up to Gatlinburg Amazing Grace, but you’ll have it all to yourself! What a way to pamper yourself in the mountains! 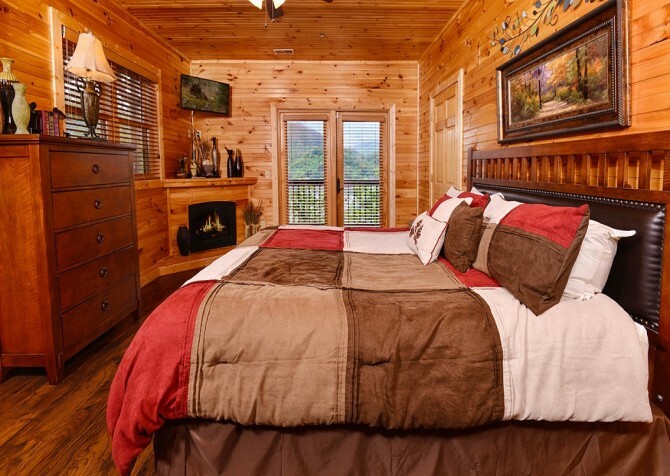 Gatlinburg Amazing Grace boasts eight spacious bedrooms with room to sleep a total of 29 guests. 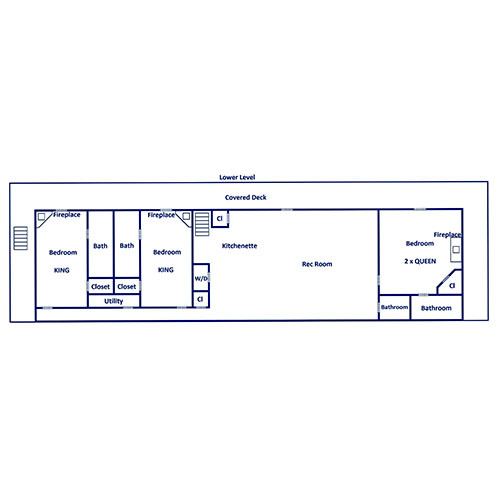 There are seven king-size beds, two queen-size beds, five sleepers, and one twin sleeper. Each gorgeous bedroom has its own bathroom, providing plenty of space and privacy for every guest. The bedrooms also boast electric fireplaces, large closets, large vanities in the bathrooms, deck access, CD players, cable TV, and flat screen TVs with DVD players. Seven of the bedrooms have 1 king-size bed each, and 1 bedroom is furnished with 2 queen-size beds. On the upper level, the royal master suite is a luxurious retreat for couples, with lots of space, mountain views, an elegant 4-poster bed, deck access, and its own fireplace! 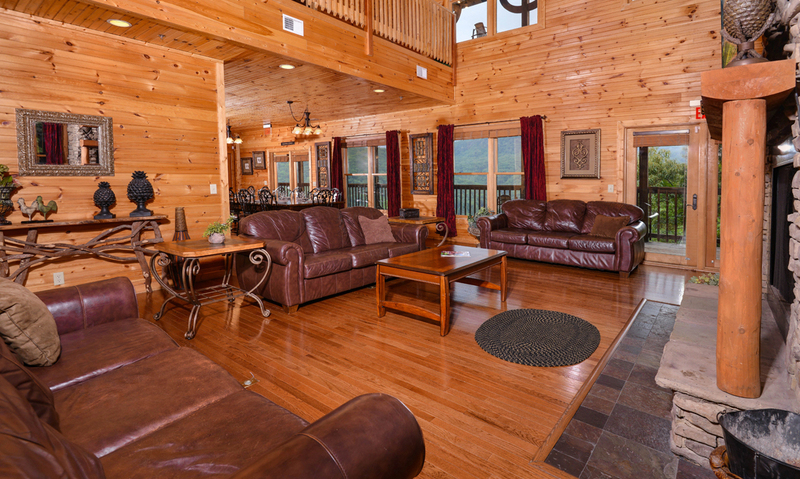 For additional sleeping space, 1 leather sleeper sofa is located in the living room, and 2 more sleeper sofas are located in the rec room. Each bedroom is a true retreat, so every guest will feel pampered in this luxurious cabin. 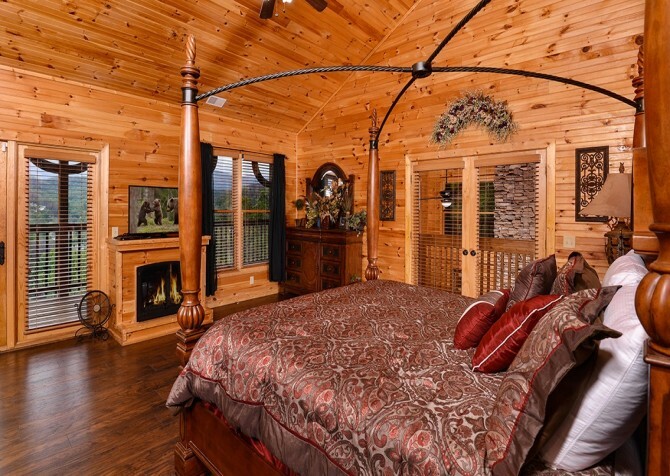 One king bedroom features a unique log bed with rich red and gold bedding. 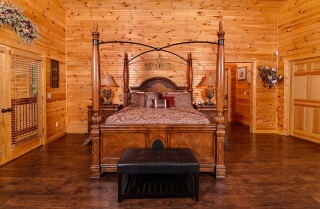 Another is furnished with a black bed with mountain carvings and complementing nightstand and dresser. 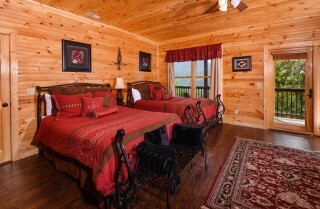 In the bedroom with 2 queen-size beds, find beautiful red bedding draped over the detailed iron beds. In another king bedroom, a four-poster bed is elegant and paired perfectly with beautiful nightstands and a large dresser. 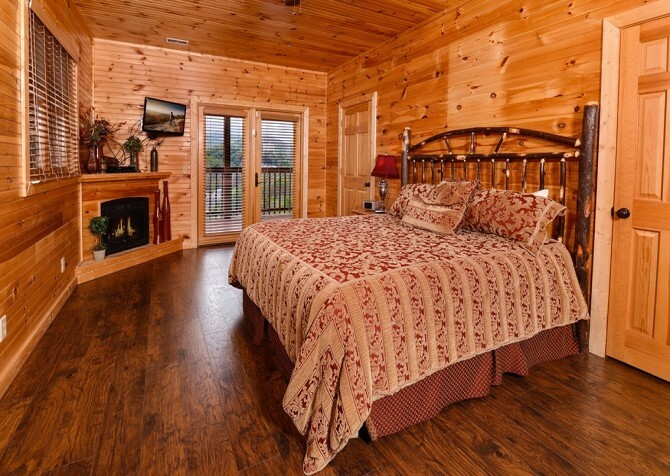 Every room is unique and beautifully decorated, allowing every guest to feel like they have their own little luxury escape in the mountains. 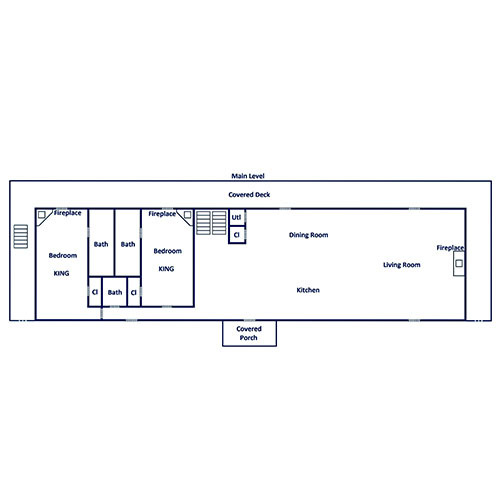 They offer enough space for guests to unpack and be comfortable. 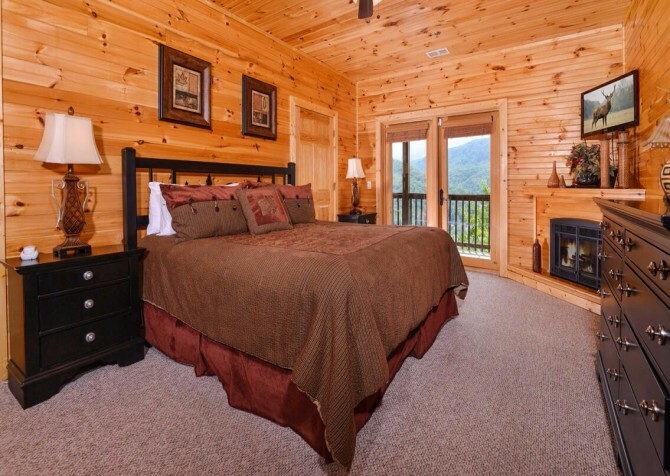 And with deck access from each bedroom, every guest can start the morning by breathing in the fresh mountain air of the Smokies. 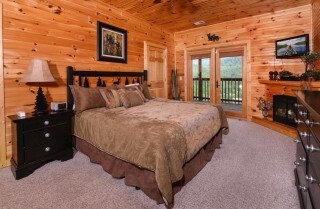 This cabin has been styled, furnished, and built with luxury and comfort in mind. Whether you're traveling with kids or adults, you'll find that these spaces will please even the most discerning guests. 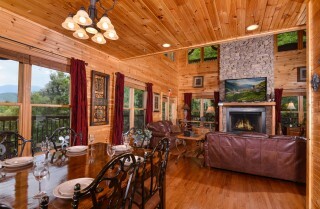 A stunning large group lodge that exudes luxury, Gatlinburg Amazing Grace offers the best of mountain living. The indoor spaces are stylishly decorated, comfortable, and large enough for a big group to play, sleep, dine, cook, and relax. 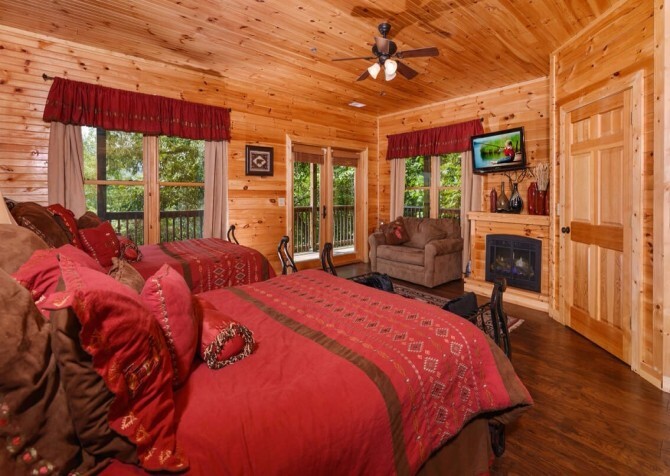 Guests will love the big screen TVs, DVD players, luxurious bedrooms with their own bathrooms, large rec room, and all the comforts of home. 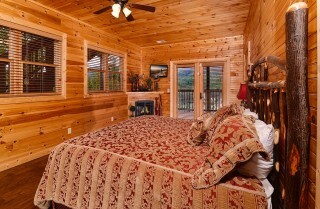 The exterior spaces are also great, with 2 hot tubs, fantastic mountain views, and deck access off every bedroom! 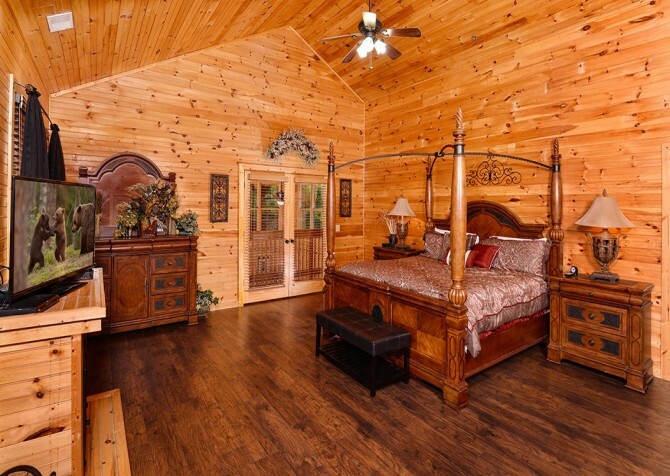 Although it's not too far from town, you don't have to leave the cabin for anything. You can relax, eat, and stay entertained in this luxury Gatlinburg cabin! 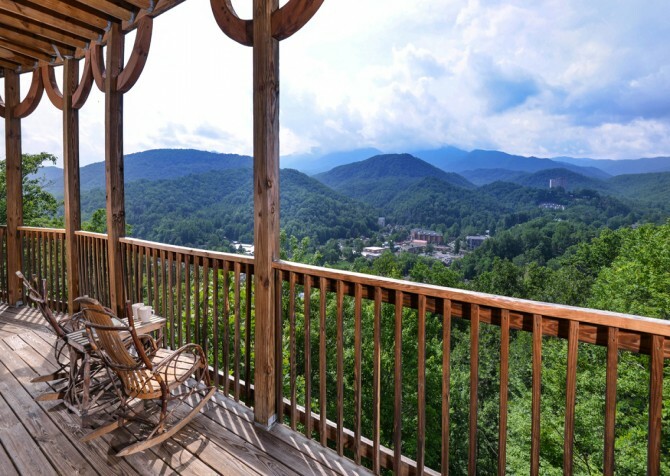 Looking out over the City of Gatlinburg and Ripley's Aquarium of the Smokies, Gatlinburg Amazing Grace offers the best of both worlds – city views and the serenity of the mountains. While you can enjoy peaceful days and nights in the Smoky Mountains, you'll also enjoy a short drive to area attractions. 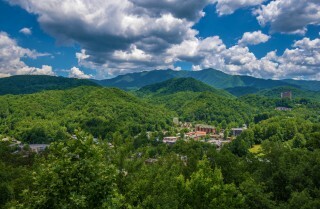 The Parkway in downtown Gatlinburg is home to dozens of great restaurants and fun attractions, offering plenty to do for any large group. Home to thousands of fish and underwater creatures, this popular downtown attraction is ideal for groups. Explore the Penguin Playhouse, Touch A Ray Bay, Shark Lagoon, Coral Reef, Tropical Rainforest, and more. 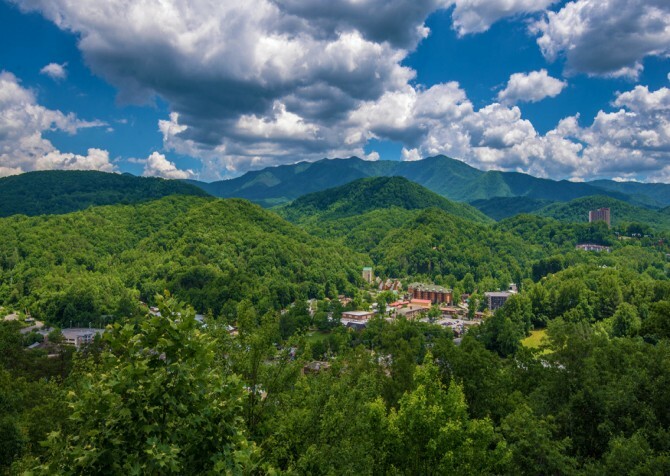 Hands-on kids' areas and live shows, along with a gift shop and unique experiences, make this Gatlinburg destination a favorite year after year. Enjoy 360-degree views of downtown Gatlinburg and the Smoky Mountains from the top of the Gatlinburg Space Needle. The 400-foot observation tower features glass elevators, an arcade, a pizza place, a gift shop, and the Iris Theater. The longest pedestrian-only suspension bridge in North America, this new and impressive attraction gives you a unique view of the Smokies! Head to the newly renovated Gatlinburg SkyLift to check it out! "Gatlinburg Amazing Grace- Great location, Beautiful cabin with a wonderful view of downtown Gatlinburg. Simple and fast reservation and check in/out process. Best trip ever!" 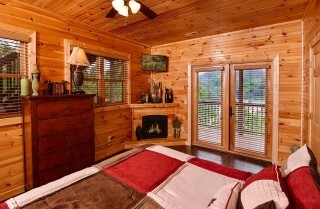 "Gatlinburg Amazing Grace cabin was awesome! The 24 of us had plenty of room to enjoy being together, and also large bedrooms with baths for privacy. The cabin was very clean and had beautiful views. Hope we can return soon!" 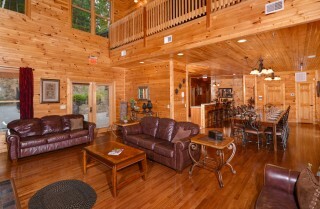 "Our family of 24 had a great weekend at this cabin! 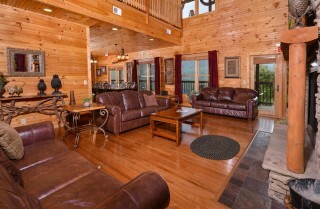 Beautiful cabin with wonderful views! Great spaces to be together as well as plenty of privacy. Large bedrooms with a private bathroom for each. 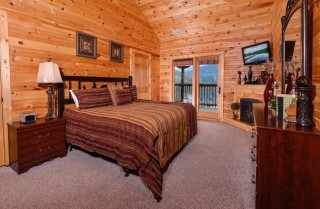 Would definitely recommend this cabin!!"